For all of the press coverage that MF Doom has received over the years, I’m yet to read anything addressing his penchant for consistently offering cover versions of his songs, in the same way that jazz artists such as Billie Holiday used to do; re-recording the same song again with a different vocal delivery, slight adjustments to the beat. This might not seem like a big deal, but coming from an era where many rap albums were simply a few hit singles surrounded by filler, hearing Operation: Doomsday in its entirety was a revelation. Based on the tracklisting, since eight of the songs had already been released on 12-inch in the two years preceding the album, it technically only contained four new tracks if you ignore the skits and the outro. If DOOM had just slapped on all the old versions of those previously released cuts on there, it may have gone down as the worst value rap album of all time, even surpassing Rob Base and DJ EZ Rock’s first LP. Thankfully, the artist formally known as Zev Love X remade the whole thing from scratch. In some cases the musical differences are subtle, while elsewhere the way that he re-jigs the beat on ‘Dead Bent‘ for the LP version makes it sound like a whole new song. He also traded in his five dollar Tandy Electronics microphone for a slightly more able ten dollar model, which offered a modicum of more clarity. Most importantly, the fact that the entire thing was remade from scratch gave the album a wonderfully cohesive feel, which is no mean feat considering that it would take until 2010’s Marcberg for another self-produced rap album to match its effectiveness as a themed piece of work rather than just a collection of songs. It also felt like a hidden easter egg for those of us who had already digested the earlier songs, with the new interpretations shining a whole new light on the existing material, adding a fresh spin to his heavily coded musings and forever inspiring debate amongst fans as to which versions were superior. The same thing happened when DOOM and Madlib recorded the Madvillainy album in 2004, only this time it was the result of the demo takes being leaked on the internet 14 months before the record was officially released. The response to the demo takes was positive enough that Stones Throw Records eventually released that version officially on cassette as part of the Madvillain remix bundle. 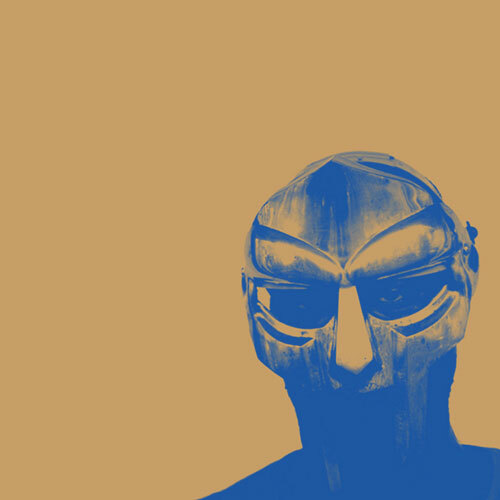 You can hear a marked difference between DOOM’s delivery on the first take and the final version, as he sounds a lot more relaxed and nonchalant (read: stoned) on the finished product, effectively making Madvillainy the first ever hipster rap album. Meanwhile, the single ‘Yee Haw‘ was re-recorded in a more laid back style and renamed ‘Kon Queso‘ for the MM…Food album (with a third version turning up on a compilation from the Molemen production team), and Doom remade ‘Rhymes Like Dimes‘ with Megalon for Greedy Fingers’ album. Further adding to the intrigue, an early recording of ‘Gas Drawls‘ was played on the The Stretch Armstrong Show, with some slightly different lyrics and sounding more like a Black Bastards outtake in terms of vocal tone, while alternative takes of songs from that ill-fated album were issued on the Fondle ‘Em label. MF DOOM is clearly a perfectionist, and while I don’t always enjoy the re-recorded versions of his stuff as much as the originals, I can appreciate what he’s trying to do in terms of delivering well-rounded albums that flow from one track to the next. While rappers often record rough takes and demos versions of songs, very few have adopted DOOM’s method of officially releasing these various takes so that listeners can track his progress while having the luxury to pick and choose which version of Metal Face they prefer ringing through their headphones. Perhaps it’s not for everyone, but the idea that there is no such thing as ‘the perfect take’ in rap is something I’d like to see explored more in the future.